Ganja White Night puts on a great show, and the wobble duo alone would be enough to catch our attention for an incredible night of music. However, something that is just as impressive as their catchy tunes and mesmerizing visuals is the talented crew they’ve got accompanying them for their 4/20 show in Colorado in 2019. Ganja White Night & Buds has a stacked lineup, sure to impress anyone who loves the unique sound that any of these artists share. Each of these artists brings something completely different to the table. 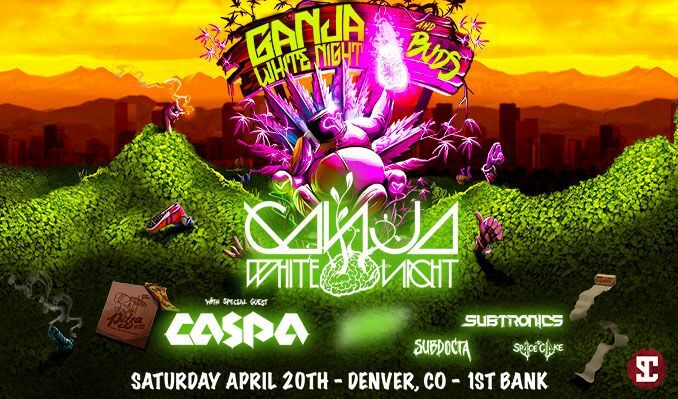 So far, this show at the First Bank Center in Broomfield, Colorado, will be the home to thousands of music lovers coming together to celebrate this “holiday” with Ganja White Night, Caspa, Subtronics, Subdocta, Space Cake, plus one more TBA artist! So, let’s meet the buds! Caspa is a producer from the UK, and is a “bass pioneer,” “DJ” and “straight-talking dubstep champion.” He has over a decade of discography that has had an impact the EDM community Caspa has been at the heart UK bass culture, and has gained lots of love anywhere his music is played. His sound is unique and he puts on an incredible show, surely to be a huge part of the success of this 4/20 show. He is definitely someone you should check out. Subtronics is an electronic music producer and DJ, a part of the Subcarbon Records. His music is very bass and riddim heavy and has gained a lot of traction within the past few years. In 2018, he released his album Depth Perception and his new EP titled Pashmina Death Sauce. He has many songs with some other Subcarbon artists, such as Boogie T and Dirt Monkey. Subdocta is a producer and DJ as well, based in Reno, Nevada. His sound is very unique, as he mixes a lot of different styles within his work. He is also a part of GWN’s record label, Subcarbon. In 2018, he released his EP titled West Coast Wobble. He is inspired by old dubstep tracks, which you can hear in some of his own songs. Space Cake is an up-and-coming bass music artist from Des Plaines, IL. He’s gained traction from the Subcarbon crew as well, after releasing his song “Space Maintenance”. On his twitter, he stated “Can’t wait to start this new journey and release new music. You think “Sub Maintenance” was good? Haha. Just wait till you hear these new tunes I’ve been working on…” Since this is all we have so far, we’re stoked to hear what he has in store for this show and can’t wait to see him gain some new fans! If you like what you’ve heard, tickets are on sale now! Purchase your tickets here and see you all on 4/20.